This past weekend, I had the luxurious pleasure of traveling to the Caramoor estate to attend lectures, recitals, and a wonderful opera as a part of Caramoor’s bel canto opera festival. What better way to spend a Saturday than wandering gorgeous estate gardens, picnicking outdoors, and listening to breathtaking music? Needless to say, I had a fantastic time. I also knew that I had to dress right for the occasion. I needed something that would be comfortable during the two-hour car ride, durable for walking around the estate garden paths, and formal enough for an evening opera performance. 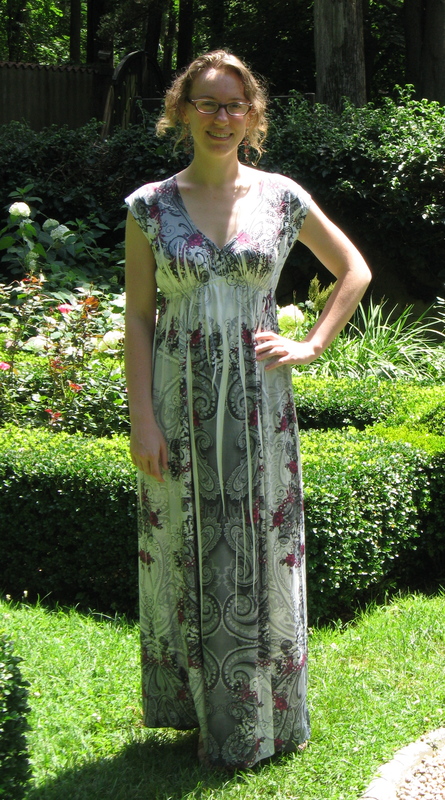 This dress was my solution: the maxi length gave it a touch of formality, while the breezy knitted fabric made it comfortable for strolling around on a summer’s day. You can’t see the shoes from the picture, but I wore my favorite pink ruffled Clarks sandals. These are literally the most comfortable shoes I own, and surprisingly durable. I highly recommend them to anyone looking for cute but comfortable vacation shoes! Yup, just what I said. There is just too much to do this summer! I have become a terrible blogger as a result. 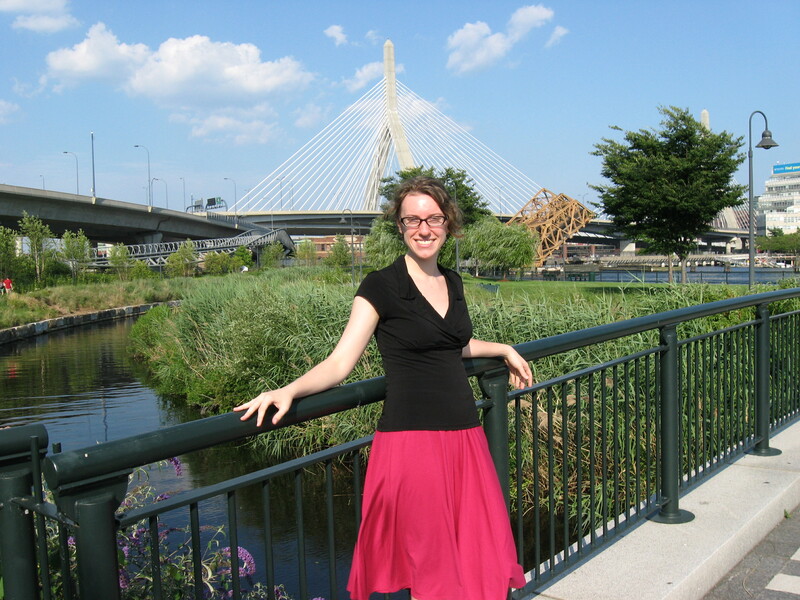 While most of the summer has been filled with work-related “distractions,” I do have a few fun things to report – like my trip to Boston last weekend! This outfit was a highlight from that visit. The skirt is actually a strapless knit dress that doubles as a skirt, which made it perfect for traveling, since I got two outfits in one! I hope to soon post a pic of the dress by itself so you can see what I’m talking about. Do you have any favorite travel items? Happy Independence Day, everyone! 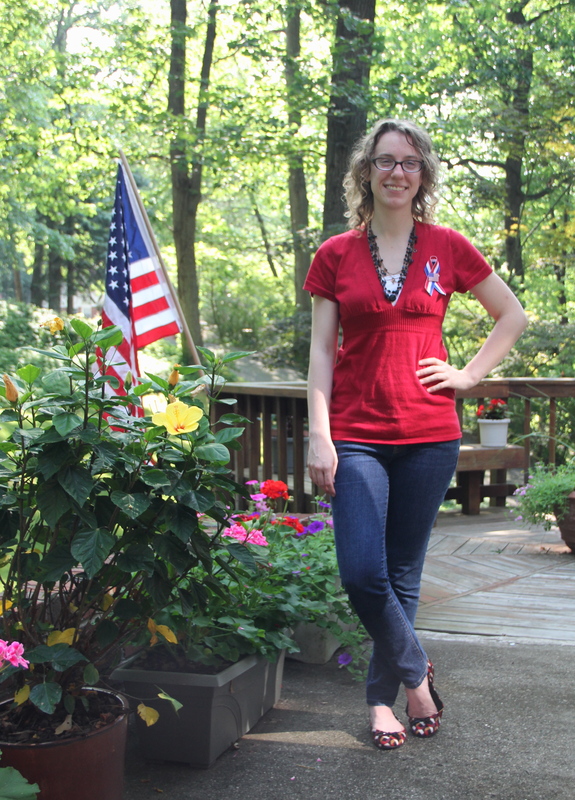 As a novice fashion blogger, I figured that I should at least try to wear red, white, and blue in honor of the occasion :). I hope you all have a fun, safe, and relaxing holiday! As I mentioned in my previous post, I have a few crafty tendencies when it comes to garment-making. Most of my crafting skills, however, were handed down to me from my mother, who is brings garment-making craftiness to a whole new level! 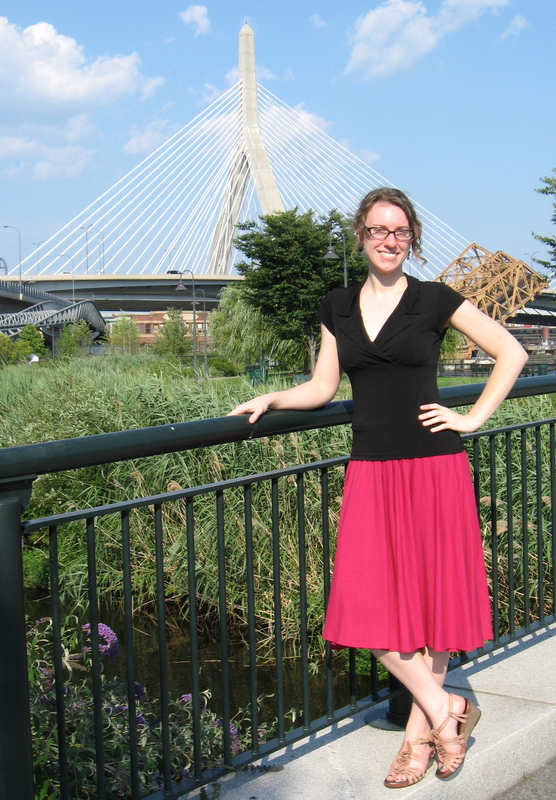 She made the lovely white eyelet skirt in today’s outfit, and it’s one of my all-time favorite wardrobe pieces. The necklace is also a family artifact – I’m pretty sure it once belonged to my grandmother. So this outfit unintentionally turned into a family tribute piece. I was hoping the necklace would tie together the different vibrant colors from my top, shoes, and emerald-green toenails. Judging from the comments I received today, I think it was a success! Do you have any favorite family heirlooms in your closet? 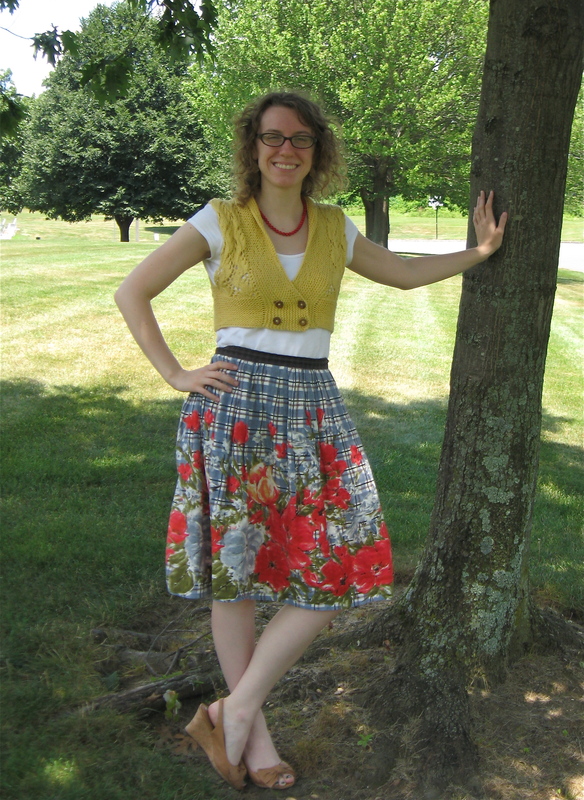 T-shirt: Ann Taylor, Skirt: Anthropologie, Vest: hand-knitted by moi, Shoes: Clarks, Necklace: Gift from China! Being a professional musician doesn’t leave much time for hobbies, but I do have a few, and all of them are fairly nerdy. One of my current obsessions is knitting. The lovely yellow vest you see here is one of my favorite creations! It was a very quick knit, since I used very big yarn and very big needles (my favorite kind of project!). In fact, it was so fun, I then made another for my sister (who gave me the fantastic coral necklace I’m wearing). In case you’re interested, I got the pattern off of Ravelry, one of the best knitting websites ever: http://www.ravelry.com/patterns/library/lacy-ribwarmer. 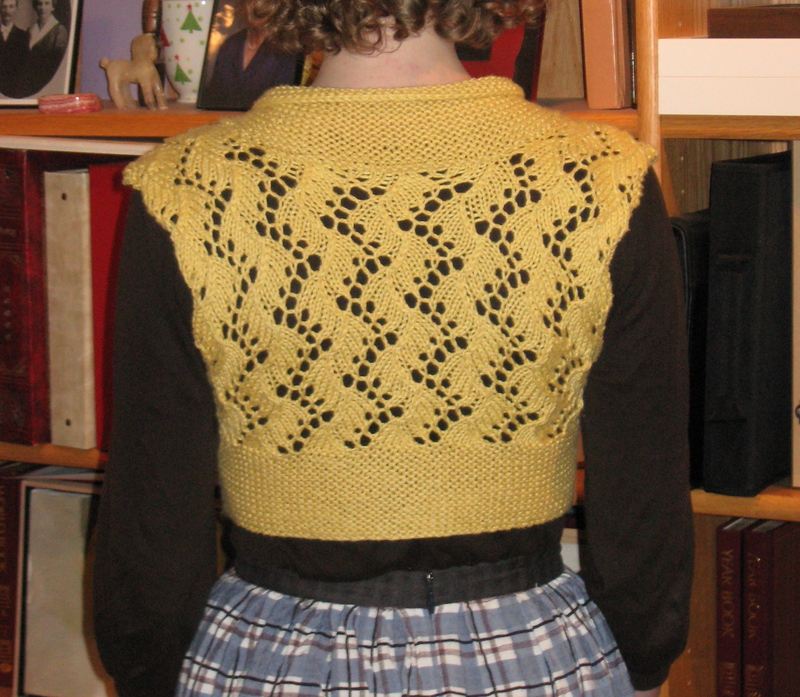 If you’re really curious, you can follow my Ravelry page and see other knitted projects – I’m titaniaem :). I will post about more knitting adventures as they get finished! I’m back! And so is my camera! So now, after a month of crazy schedules and broken-down cars (hence misplacing my camera), I can finally blog again :). During my blogging hiatus, I went shoe shopping and discovered this wonderful pair of flats. My mom always used to say, “color is free!”, and I’m beginning to realize that that applies to shoes just as much as any other article of clothing. Why have black or brown shoes when you could have pink?? (and coral really does go with more than you’d think!) Shoes can provide a great wardrobe accent, and this summer I’m challenging myself to create more imaginative/clothes shoe pairings. Do you have any favorite tricks for coordinating shoes and outfits?